In a little more than two weeks, Pelotonia, the annual Columbus cycling event will return bringing thousands biking to raise money to find a cure for cancer. Pelotonia, going into its 11th year is a grassroots bike ride that raises money for cancer research at The Ohio State University Comprehensive Cancer Center – James Cancer Hospital and Solve Research Institute. Last year, Pelotonia raised $7.8 million for research at the James Solve Cancer Center. Some of that money raised is right now being used to prevent oral cancer. This year Pelotonia is getting a boost from Victoria’s Secret. An event featuring the Supermodels of Victoria’s Secret in New York City raised $100,000. Limited Brands, parent company of Victoria’s Secret, is a lead sponsor of Pelotonia. Every dollar raised at Supermodel Cycle will be matched by the Limited Brands Foundation which will bring the total donation to more than $200,000. One hundred percent of the money raised for Pelotonia goes to The James, which is one of the nation’s leading cancer research facilities. Pelotonia’s mission is to fund life-saving cancer research. 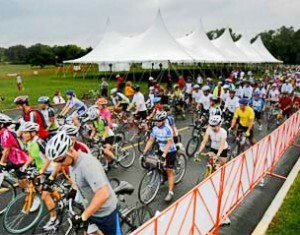 Pelotonia is a three-day experience that includes a weekend of cycling, entertainment and volunteerism. 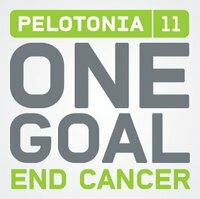 Thanks to its generous sponsors, Huntington Bank, Limited Brands Foundation, Richard and Peggy Santulli, American Electric Power Foundation and Nationwide Insurance, Pelotonia is able to direct 100 percent of every dollar raised to cancer research at The James Solve Cancer Center.